As you all know, the devastating floods along the Colorado Front Range last month grabbed world-wide attention and brought up, for those who call Colorado home, memories of the Big Thompson Canyon Flood of 1976 and the Fort Collins Flood of 1997. Everyone at CoCoHQ survived the storm, but many observers in the hardest hit areas weren't so lucky. Some stations have gone dark, and others are starting to come back online, with stories of how the historic flooding has forever changed the lives of those affected and the landscape. As there continues to be analysis of the storm and its impacts, the Colorado Climate Center has established a website with general information, storm details, climatology, hydrology and pictures. The site is continually updated, so if you're interested in learning more about the storm, take some time and read through all of the data/information available. Earlier this week, it was announced that CoCoRaHS would be the recipient of a special award from the American Meteorological Society (AMS) at the annual meeting in Atlanta, GA, this upcoming February. The statement from the AMS says CoCoRaHS will receive the award for "building a community of over 15,000 volunteer observers dedicated to providing high quality, reliable observations of daily precipitation across the United States." I've often said that the observers are the backbone of this organization and without you we would be unable to sustain this network. This award is about us all, and I thank you for your continued diligence in checking your rain gauges everyday. I will be in Atlanta for the conference this year and will make sure to post pictures of CoCoRaHS being recognized during the award banquet. One of the things I enjoy most about being a part of this program is the stories and the pictures I get from observers. After sharing pictures of my new (and amazing) office, I received the following pictures to share with you. I received these beautiful pictures from Beth (FL-AL-2). Beth and I have been exchanging emails and have discussed our mutual love for clouds, and weather, and the importance of always having a camera with you. This lovely seascape photo overlooking Hillsborough Bay (ISO) was sent to me by Don (FL- HB-10). Don has sent me numerous pictures since joining CoCoRaHS in 2007, each one as stunning as the last. 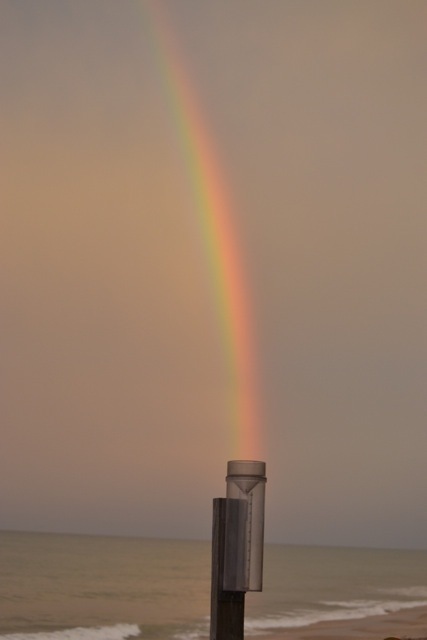 Sherman (FL-BV-11) took this breathtaking picture of a rainbow out by his rain gauge. While the gauge is the pot of gold in this picture, I know we haven't developed the training to actually measure the vibrant colors! Rainfall totals across the state varied in September (Table 1). Since the unusual heavy rains this summer that removed drought in the state, precipitation across the state has been closer to normal at most locations. However, rainfall totals along of the East Coast (from Jacksonville to the Space Coast and from West Palm Beach to the Keys) were up to 5" below normal (Figure 1). 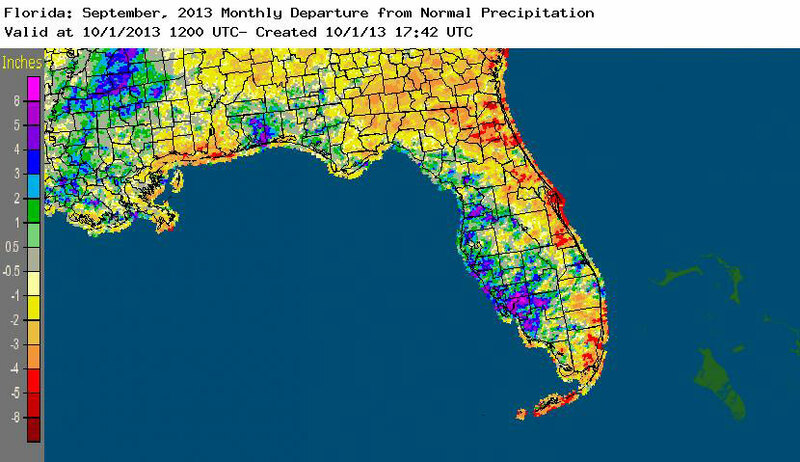 On the opposite coast, areas from Hernando to Collier counties reported rainfall totals over 8" inches above normal. Santa Rosa and Walton counties in the Panhandle also reported above normal rainfall for September. 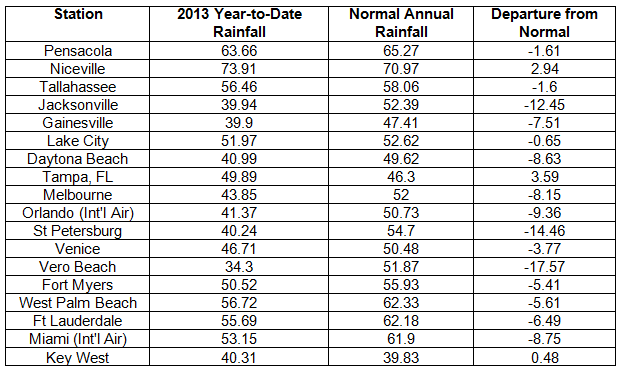 At the time of press, there were only a number of precipitation records that were available from September (Table 2). Table 1: September precipitation totals and departures from normal (inches) for select cities. Table 2. 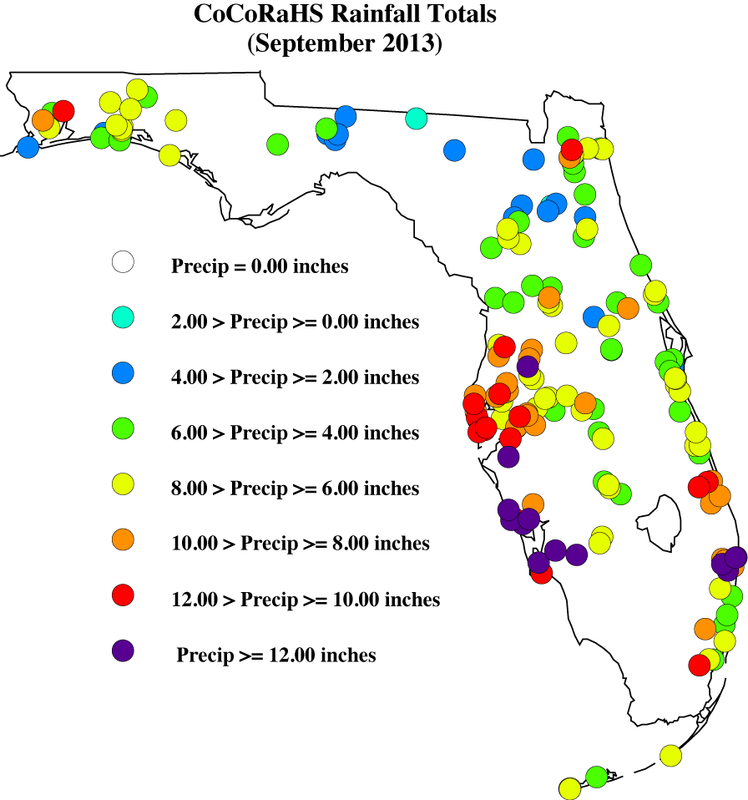 Select daily rainfall records (inches) broken during September (compiled from NOAA, NWS). Figure 1. A graphical depiction of the monthly rainfall departure from normal (inches) for September is given in the figure below (courtesy of NOAA, NWS). Here are the CoCoRaHS rainfall totals for September from some select CoCoRaHS stations across the state. With the above normal rainfall during the summer of 2013, here are the current year-to-date rainfall totals from select locations around the state, including their departures from the normal annual precipitation total. With the exception of the East Coast of the state, most locations are on pass to have normal to above normal rainfall amounts for 2013. There are three months left in the year and two months left in the 2013 Hurricane Season. 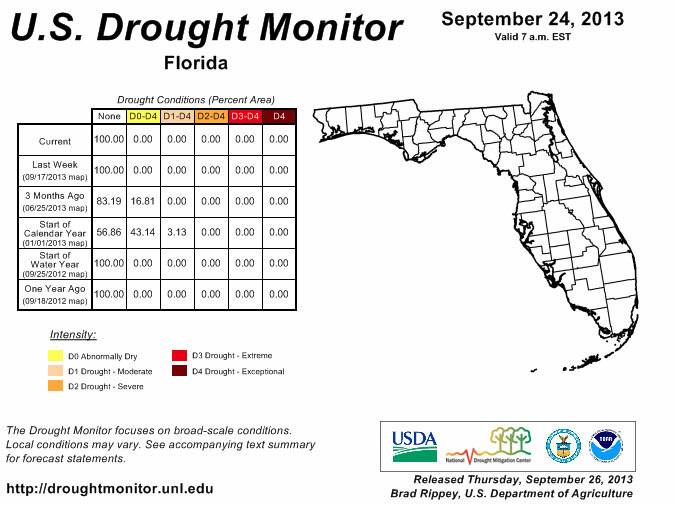 Despite below normal rainfall in portions of the state during September (Figure 1), the entire state remained drought free since July 9th is typically lower for the state, however, there are still two-months left in the 2013 Hurricane Season. The potential for a late season storm impacting the state cannot be ruled out, especially with the recent activity in the Caribbean Sea. Lake Okeechobee remains at maximum capacity, allowed during hurricane season by the Corps, and most of the stream flow gauges across rivers statewide showed normal stream flow activity, though a few gauges in the western Peninsula were above normal due to recent rains. September brought more flagged rainfall reports. Some were valid, though there are a few outstanding issues that need to be resolved. I appreciate how understanding the contacted observers were, along with how quick they were to reply to my emails, though there are a few outstanding issues that need to be resolved. Please remember: if you receive an email from me with the subject line 'Question About Your Recent CoCoRaHS Observation', please take a moment to answer me back. And if you have any questions, please feel free to contact me. Make sure to like 'Florida CoCoRaHS' on Facebook! Observers can now post comments and pictures to the wall.